I found a way to fill out this Split 9-Patch so it will not be a long, skinny quilt. Next stop: borders! 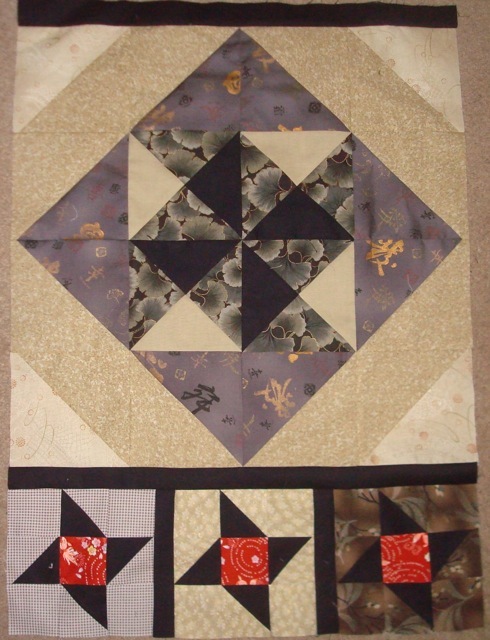 I know I haven’t kept the blog updated consistently, but at least I’ve been trying to be consistent about my quilting. I have tried not to start anything new, but I have been allowing myself to play with squares given to me by the Comfort Quilts group at my Quilt Guild. I’ve already made one quilt top with the squares, but that didn’t use them up, and, you know me, I can’t just sew squares together and make a quilt…there has to be some interesting (at least to me) design twist. 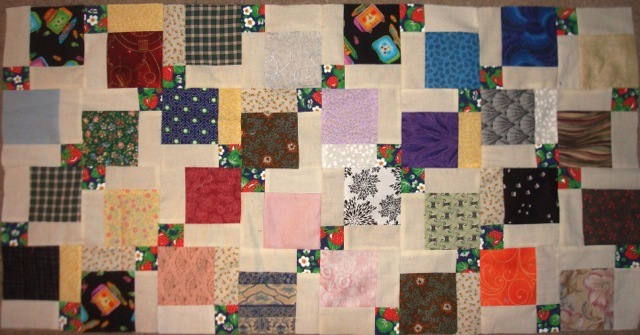 I think I mentioned that I finished all the blocks for the Cross Roads quilt. I have Aiming for Accuracy up on the design wall now, so those will have to wait. It’s weird to think that A4A (as I’ve come to call it), is almost done. The first two sections (actually rows) have been sewn together. I’m actually a little ahead of the game since after I completed the second row, I sewed the two together. The second row of Aiming for Accuracy. I’m running a bit late on the place mats I was supposed to be testing. I wasn’t as careful about the seams meeting as I usually am and I don’t like them. 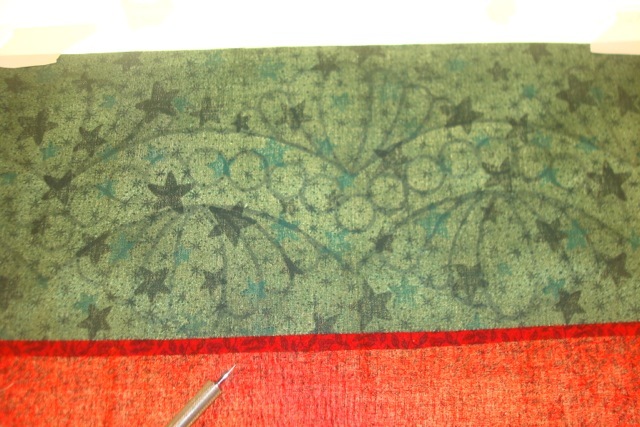 I’m also having trouble “getting into” the quilting end (as opposed to the piecing end.) Maybe if I set up a table in front of my TV in the other room, I’ll be more motivated. Until then, maybe I should contemplate what inspires me and maybe that will help me finish up projects. The first car I’ve ever owned that no one else has owned before me. Sorry I haven’t been keeping up with the blog for a couple of weeks. I have been sewing, but mostly I’ve been obsessing over cars. Specifically a car that would replace my beloved 15-year-old Saturn. It took me a good month of active searching (and over 6 months of “oh, I should be thinking about getting a new car” kind of searching) to make sure I had what I wanted and wouldn’t feel too much buyer’s remorse. It wasn’t fun, but it’s done. Aiming for Accuracy, Lesson 12. 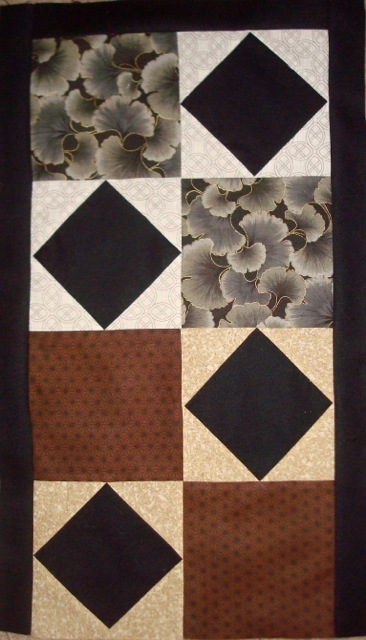 In the meantime, I’ve been trying to keep up with my quilting projects, updates to my Guild’s web site. and life, in general. The lessons in Aiming for Accuracy (Lesson 10) are now all about filling in areas in anticipation of making it a top. The “new” part of this chunk are the friendship stars at the bottom. Right now, Aiming for Accuracy is on my design wall. We’re at the stage where smaller fill-in blocks and strips are being made and added. This week (Lesson 13, which I have not yet completed), is a row of 4-patches which will enable me to sew the top row together. Unfortunately, putting Aiming for Accuracy up on the design wall has left me pausing in the piecing of Cross Roads. 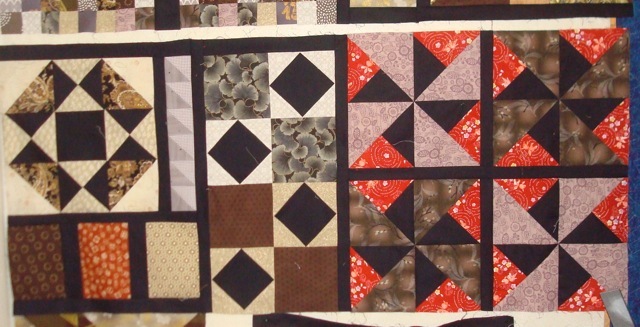 I have finished all the Cross Roads blocks, but since they’re scrappy, I need to lay them all out. I usually do this on the design wall so I can shift them around, walk away, come back, and shift them around again for a couple of days, but since Aiming for Accuracy is so complex, I don’t want to take it down until it’s in bigger chunks. So instead I feel should be finishing the quilt marking of the Xmas Dear Jane, but I’m kind of uninspired. I have all the quilting motifs planned, and I only have a couple more to mark, but now I’m just not as enthusiastic as I was. Still marking quilting lines on Xmas Dear Jane. I have Grandmother’s Choice prepped for the long arm, but I haven’t talked to Cricket about going over to use it. I’m hoping that spending time with my friends at our Guild meeting on Monday will get me feeling more confident and happier about my projects. 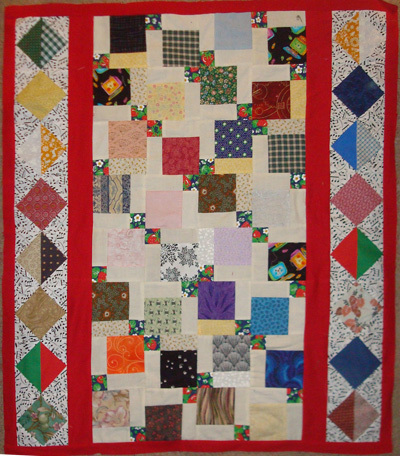 I’ll be showing The Quilt That Shall Remain Nameless and Flower Pot. Finished Aiming for Accuracy Lesson 10 on Monday. 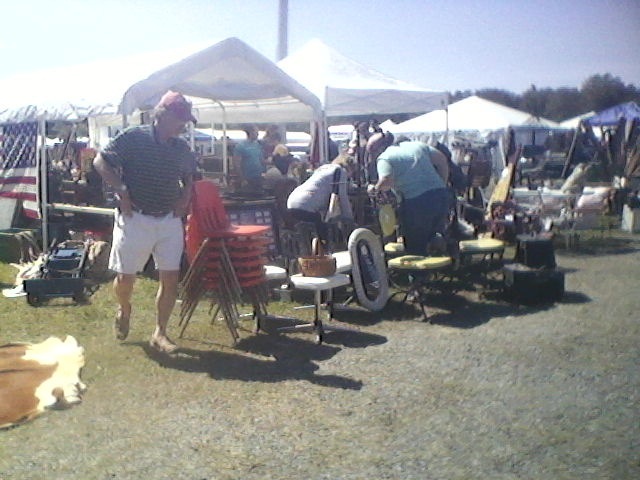 It was a beautiful day at Brimfield…not too hot, but still bright and a nice breeze. 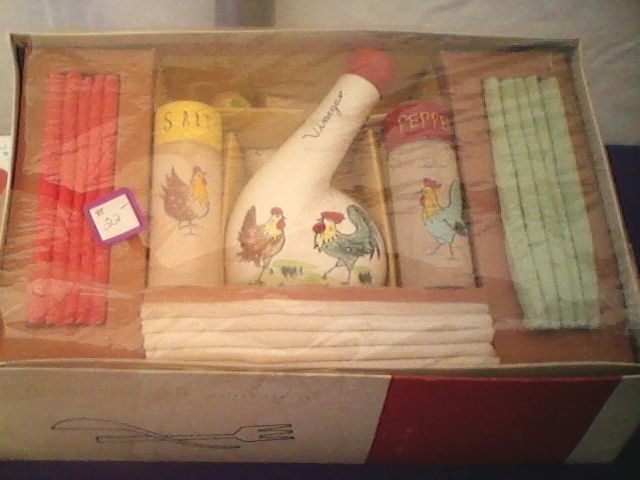 I didn’t find any interesting or unusual quilts, but Chicken items kept “popping up” on my shopping radar. Lots of old signage this time. 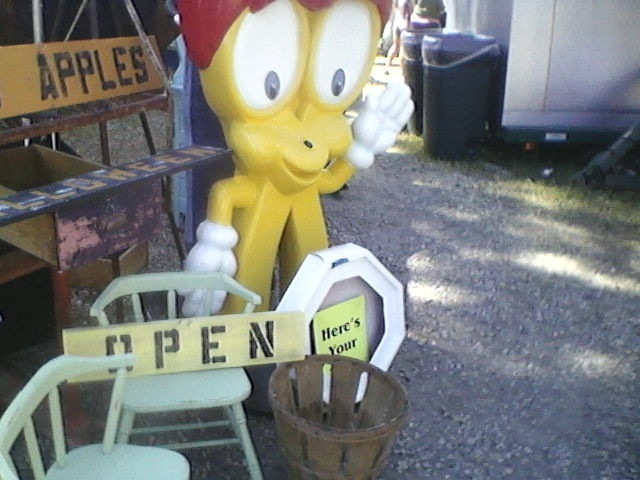 We couldn’t figure out who this character was supposed to be or what item or place he had advertised. If anyone knows, please leave a comment! 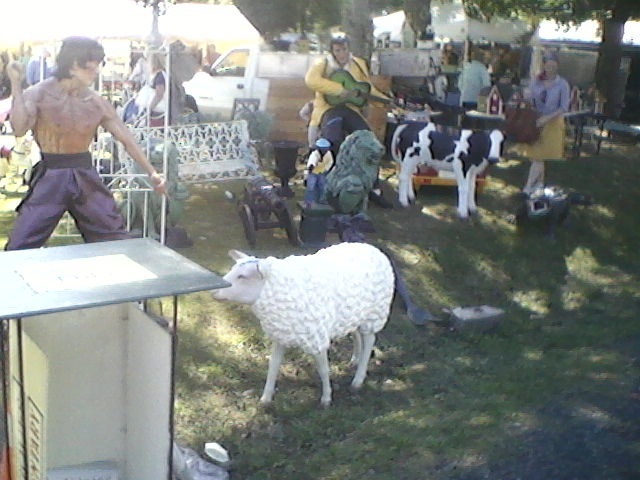 Speaking of advertising, this booth not only had Elvis and Bruce Lee, but a cow and a sheep… all yours for the right price.